At 20 weeks inside the womb, Faith Aminah Shabazz was diagnosed as having anencephaly. 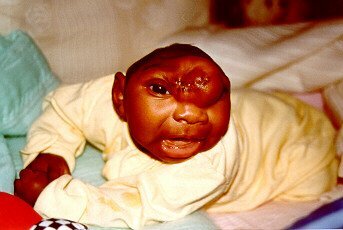 Anencephaly is a neural tube defect where a major portion of the brain and skull is not developed. 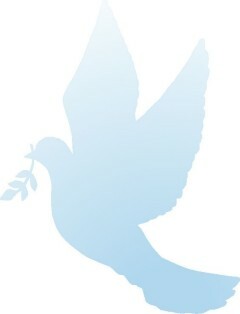 Rahim comforted me as I cried and cried and prayed to God not to let this happen to us. The maternal fetal medicine specialist said that most people terminate their pregnancy. We both said that terminating the pregnancy was out of the question. The doctor then said that Faith Aminah would either be stillborn, or die within a few hours, which is typical for anencephalic babies. We kept right on praying to God for the healing of our baby. Visit after visit we kept praying for a change on the ultrasound. The result appeared to always be consistent. We told our family and friends what we were told by the doctor. Their hearts and prayers went out to us. During this time my cousin Armi was reading a Jet magazine. She called me up to share a story about having hope and faith, and believing that what God had done for Olympia McGill and her baby, Felici, he could do the same for me. After reading Olympia's story, I called information for her phone number. I left several messages for her. I was anxious to share my story after hearing how God had healed her baby. She said the doctors had also told her that her baby had no chance of survival. As months passed, Olympia and I became great friends. She was here for the birth of Faith Aminah, along with my mom. Rahim and Olympia were at my side in the delivery room. My mom came up for a few weeks to help out with Jeffery and Tarrez, Faith Aminah's older siblings. Faith Aminah also has two other brothers, Julien and Malik from her father's previous marriage. Mother was a great help and inspiration. 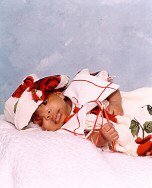 On March 26, 2001 at 4:36 P.M., I gave birth to a beautiful 7 pound - 12.4 ounce baby girl. Faith Aminah was welcomed into the world by her father and me. 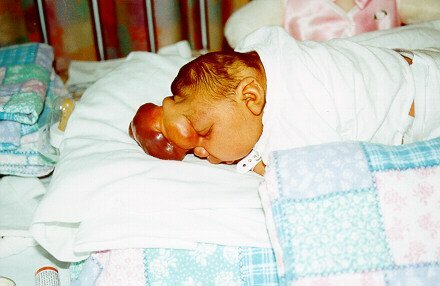 She was born with a large anencephalocele. The doctor said to spend as much time as possible with her because she would die shortly. Rahim and I were holding and comforting our baby and each other. We did not prepare for the worst even though the circumstance and the history of the disease were not good. But our Faith Aminah was strong throughout my pregnancy. Rahim had given me a prayer to always pray for all of us: "Lord cleanse us inside; Make us a new creation in your love and grace." The forebrain and cerebral portion were on the outside of her head. 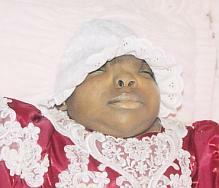 After Faith Aminah was born she was left in the room unclean for almost 2 hours while the staff was expecting her to die. My family finally told the hospital staff to take Faith Aminah to the nursery to clean her up. The staff placed her in the corner of the nursery for 6 hours, still expecting her to die. 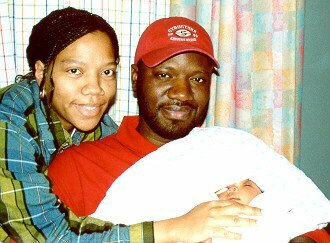 On March 29, 2001, Faith Aminah and I were discharged from the Hospital. We had her transported to Egleston Children's Hospital. We spoke with the neuro-surgeon, neurologist and other staff about Faith Aminah's condition. The neurologist and the neurosurgeon gave her no chance of surviving more than a few more days and gave us the historical data about anencephaly. But with our faith in God, we knew our baby was a fighter since day one. We stayed in Egleston Children's Hospital for about 6 or 7 days. The neurosurgeon stated he would do the surgery one week from that day, and scheduled surgery for Tuesday after his long weekend. On Tuesday the doctor came in, and appeared to be disappointed or surprised that she had survived. The doctor threw another stumbling block at us, stating that if Faith died on the operating table he would not resuscitate her. We would not agree to that, and he refused to do the surgery. We immediately contacted another neurosurgeon from Scottish Rite Children's Hospital. He quickly responded to the need of our child along with team of professionals. This doctor not only cared about my child's well being, but the rest of the family also. He removed the anencephalocele. Today, we believe that his contribution has enabled Faith to live. Faith is a miracle baby from God. She is still with us today. Through my research on the internet, we met the most compassionate couple in the world, Patricia and Steve. Their Mary Elizabeth won our hearts, and after reading about their loss our heart and prayers went out to them. Since our contact with Patricia and Steve, we have become close friends, and give special thanks to them for guiding us with the development of our web page. In closing, we want to thank everyone that stood by our decision to have Faith Aminah, and everyone that prayed for us and continue to keep us in prayer. Thank You! With God all things are possible and Faith's presence is truly a blessing from God. We all have a purpose here on earth. We may not see it when we want to, but when God reveals the Veil, then we shall see. Shortly after Christmas, 2001, we were expecting another child, who was born in August, 2002. Baby Samuel was born healthy, with no complications. 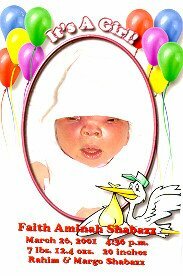 Faith celebrated her first birthday in March, 2002, her second birtday in March, 2003, and was doing well overall. Faith passed away on October 4th, 2003 after a brief illness. My warmest thoughts and appreciation go out to everyone who was made a part of our family, especially for Faith. Please continue to keep us in your prayers. A bushel of love, that was Faith. A bushel of love straight from heaven into my arms and heart. You never know what God has in store for you. You must always be ready because all of God's gifts are good and perfect. Speaking of perfect, from her tiny little feet to the sparkle in her eyes, she radiated so much love; only the kind of love that can't be explained. Precious, pretty, and perfect is what describes our little Miss Faith Aminah. Her name dances just what she is: Faith that pleased our heavenly Father and for whatever reason God the Father was pleased with me that we were blessed to be the parents and I her caretaker. I pray I did the best I knew how. Now I understand what the word of God means when it says "Be careful how you entertain strangers because some have entertained angels unaware." We know Faith was an angel to anyone who came in contact with her. She was different, yet the same, just like Jesus was different, yet the same. We are all one and the same. We pray that all receive some of God's pure love from Faith. Let us celebrate Faith's life until we meet again. Faith, we know you will never feel pain again. You will suffer no more. No one will look at you strangely. Mommy, Daddy, Sister, and Brothers love you. Pictures of Faith and her family. Pictures of Faith's first Christmas. Pictures of Faith's first birthday. 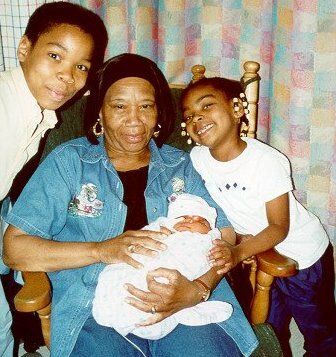 Pictures of an older Faith and her family. Pictures of our farewell to Faith.